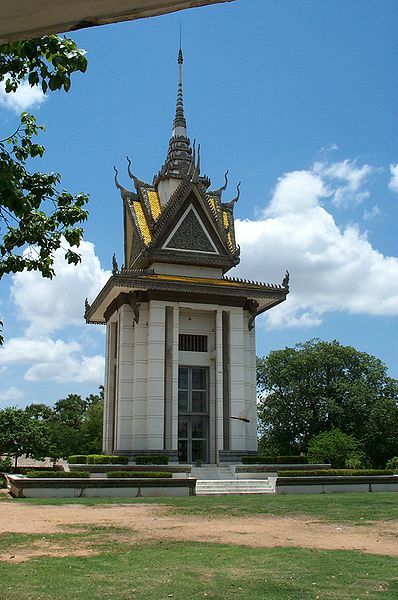 The Choeung Ek Stupa, one of the locations with the highest RPC-140 ratio. Containment Protocols: OL-Site-140 is to be the center for study of RPC-140. If RPC-140 phenomenons appear inside Cambodia, MST Uniform-40 ("Walking Napalm") is to be deployed with the intention of incinerating as much of RPC-140-1 as possible. Affected settlements must be quarantined and Extergito Glyphs are to be used on surviving citizens. In the case of these protocols failings, Level-5 personnel are to enable Protocol-[REDACTED]1. Description: RPC-140 is a phenomenon affecting locations in Cambodia with a high density of vegetation. RPC-140 seems to appear more frequently when a certain quantity of human corpses are present and buried in the soil2. RPC-140 causes vegetation to grow faster, and develop nomadic capabilities3. Affected plants are hereby called RPC-140-1. When RPC-140-1 reaches a human corpse4, it will twist its body around it, until the corpse is bound to RPC-140-1. Corpses after this stage are referred to as RPC-140-2. RPC-140-2 regain their sentience, but do not regain their sapience. RPC-140-2 works as a visual and thinking organ for RPC-140-1, helping guide RPC-140-1 and assisting RPC-140-1 in discerning what is located in its immediate environment. RPC-140-2 becomes increasingly aggressive and active when more RPC-140-2 are added to RPC-140-1. RPC-140-2 also accelerates the growth of RPC-140-1 instances by currently unknown means. All instances of RPC-140-1 are extremely hostile towards any animals in their vicinity. Upon detecting any nearby animals, RPC-140-2 will react with congested vocalizations that will alert its RPC-140-1 instance to the organism, causing it to attack. RPC-140-2 always directs RPC-140-1 to the nearest human settlement. 1. Instructions in the Protocol include Mass Napalm Bombing, Earth Scorching policies, [DATA REDACTED]. 2. RPC-140 has somtimes reappeared in locations where it has been known to have previously manifested. 3. These capabilities include moving roots capable of dragging the trunk, rapid expansion of itself, etc. 4. Non-human corpses are ignored by RPC-140-1.